Makes 2-4 servings or 10-12 fried tomatoes. I love a fried green tomato. Plain and simple. They have a tart/citrus-y and their firm texture makes them ideal for frying. 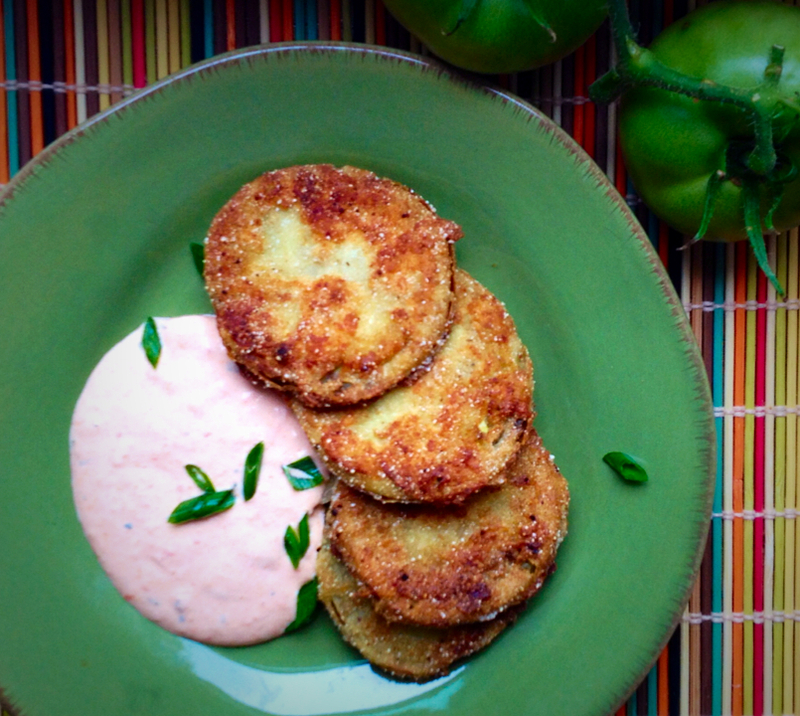 Paired with a cool and creamy Roasted Red Pepper and Garlic Dip, these Fried Green Tomatoes will be your new summertime favorite! Using a fork, mash-up the roasted red pepper and garlic in a medium-sized bowl. Get it as good as you can, almost into a paste. Then combine the rest of the ingredients. Mix well and cover. Store in the refrigerator until ready to use. Place 1/2 cup of flour in a medium bowl. Mix the egg and milk in another medium bowl. Mix 1/2 cup of flour, cornmeal, Cajun seasoning, salt and pepper in a third medium bowl. In a large cast iron skillet, pour in oil for frying to about 1/4 inch deep. You don’t want the oil to cover the tomatoes. Heat to medium high. Consider a couple of TBSPs of leftover bacon grease for some added flavor! Next, dredge each green tomato slice in the plain flour then dip in egg/milk mixture and finally coat each with the cornmeal. Repeat until all tomato slices are breaded. Place the breaded green tomato slices in hot oil and fry for about 2 minutes on each side. Just until they are a nice golden brown. Remove from oil and place on a couple of paper towels to sop up the extra oil. All done! 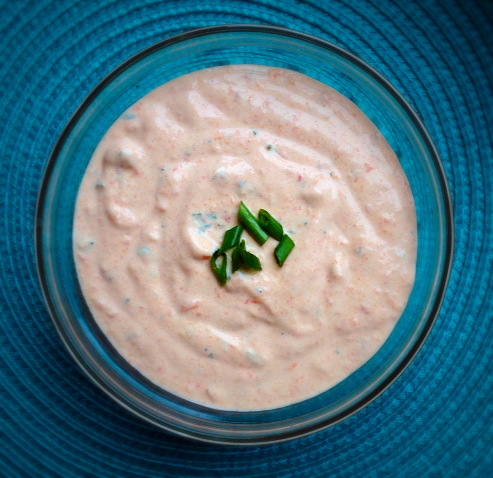 Don’t forget your Creamy Roasted Red Pepper Dip! That’s all you’ll need! Enjoy! This entry was posted in Breakfast/Brunch, Dinner, Food, Munchies, Recipes, Sides and tagged cornmeal, dip, fried green tomato, fried green tomatoes, green tomato, green tomatoes, red pepper, red peppers, roasted garlic, roasted red pepper, sour cream. Bookmark the permalink. mmmm, I wish you would have brought some by here for a taste. sounds awesome.